A severe outbreak of downy mildew was confirmed on pumpkins from a field trial at OSU-OARDC Western Agricultural Research Station. This is the first confirmed outbreak of downy mildew on pumpkins in Ohio, although it is likely elsewhere in central Ohio, if not even more widespread. Symptoms on pumpkins are somewhat different than on cucumber – the lesions on pumpkins are smaller than on cucumber, although both are angular, look watersoaked on the underside of leaves (upper right photo) and yellow on the upperside (upper left photo) initially. On pumpkins the older lesions appear bronze-brown in color (lower right photo). Pumpkin leaves can be completely destroyed if not treated with effective fungicides. With cooler temperatures expected for the rest of this week, as well as rain showers and storms, downy mildew risk is high for most of Ohio and all cucurbits should be protected with fungicides that are effective against downy mildew. Although the season is winding down, if pumpkins still need some time to reach maturity, the foliage should be protected. Information on fungicides can be found in the Midwest Vegetable Production Guide for Commercial Growers 2018; in addition, fungicide efficacy rankings from our 2017 bioassays can be found here. Control of downy mildew requires preventative fungicide application – inadequate control is often observed when fungicides are applied after infection, even if symptoms have not started to appear. Tape mount from the underside of a cucumber leaf with downy mildew. Characteristic branched sporangiophores (center) and oval, brown sporangia. Micrograph by Francesca Rotondo. 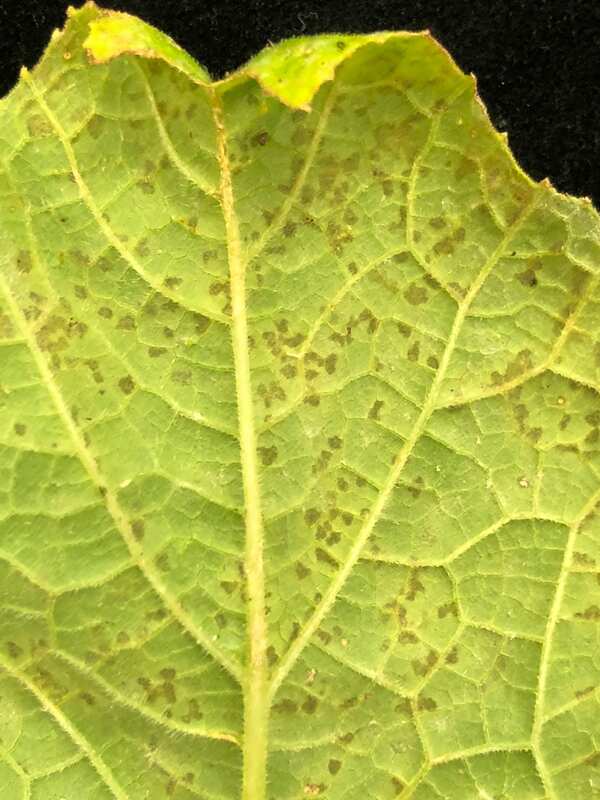 Downy mildew was confirmed today on cucumbers in Medina County – the field is in the Homerville area and symptoms were just beginning to show. The pathogen that causes cucurbit downy mildew, Pseudoperonospora cubensis, was sporulating well on the underside of leaves (see photo). 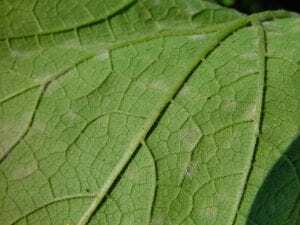 This is the second confirmation of downy mildew on cucumbers in Ohio this year – the first was on August 11 in Huron County. Please see my August 11 post in this blog for management recommendations. We still have not confirmed downy mildew on squash or pumpkins, but we have received quite a few lookalikes, most of which were bacterial spot or angular leaf spot (also a bacterial disease). Bacterial diseases will not be controlled using any of the fungicides recommended for downy mildew, with the exception of copper-based products. However, these are only partially effective against downy mildew and bacterial diseases. If you are not sure about your diagnosis, send samples to the OSU Vegetable Pathology Lab – diagnoses are free for OH growers. 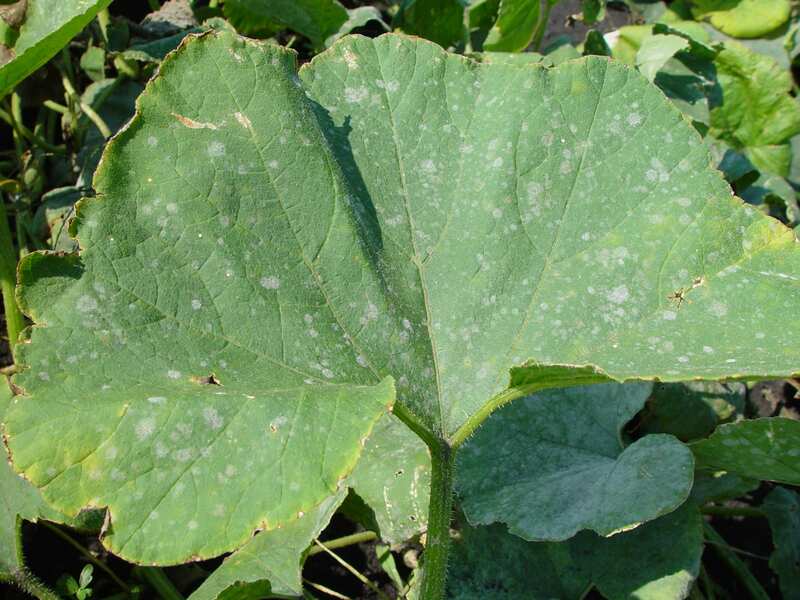 Powdery mildew is a scourge of summer for squash, pumpkins, and other cucurbits. Organic growers should always start with varieties with some degree of resistance to powdery mildew – seed catalogues often call partial resistance “tolerance”. 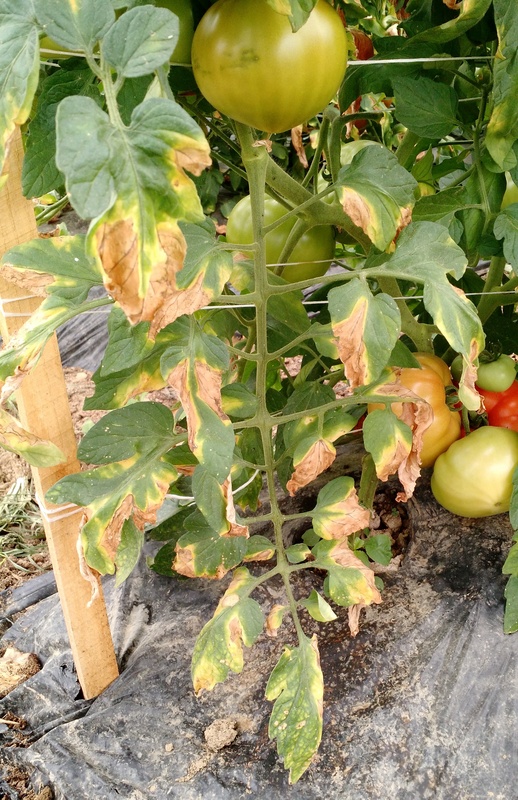 Although resistance will generally not be complete, efforts to manage powdery mildew with organic-acceptable products will be more productive if growers start with a variety that can put up a fight on its own than one that is highly susceptible. Best results are obtained when these products are used preventatively or at the very first signs of powdery mildew, usually in mid-July in Ohio. If you wait until powdery mildew has progressed to the stage you see in the photo above, it will probably be too late to get it under control. This has been a very unusual year for cucurbit downy mildew. The disease usually appears on cucumbers like clockwork on or around July 4 in one of the northern Ohio counties, but this year we found it only yesterday, August 10, for the first time in Huron County – with just two mature lesions in one of our cucumber research plots on the OSU OARDC Muck Crops Experiment Station in Celeryville. We have been expecting it due to reports in MI, IN, PA, and Kentucky during the last few weeks. 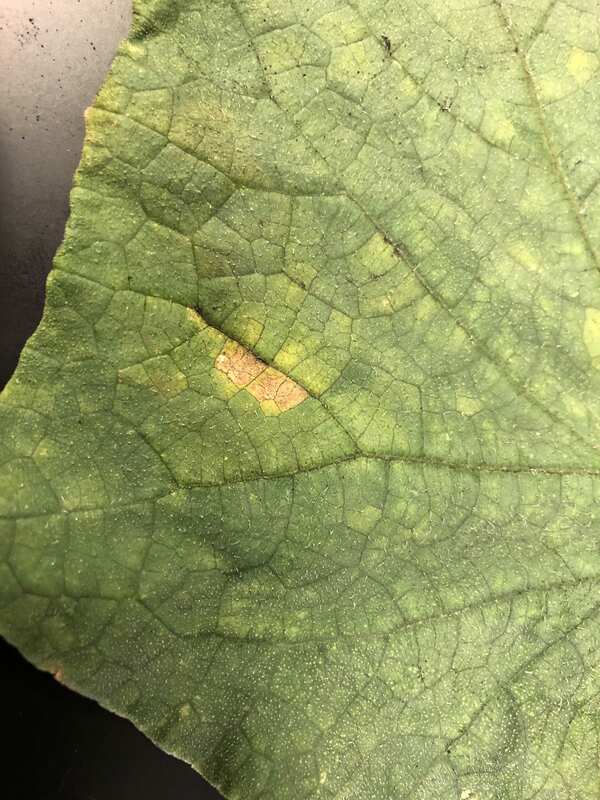 We have been receiving many samples of cucurbits suspected of downy mildew during the past month, including cucumbers, squash and pumpkins, but nearly all of these had bacterial spot or angular leaf spot. 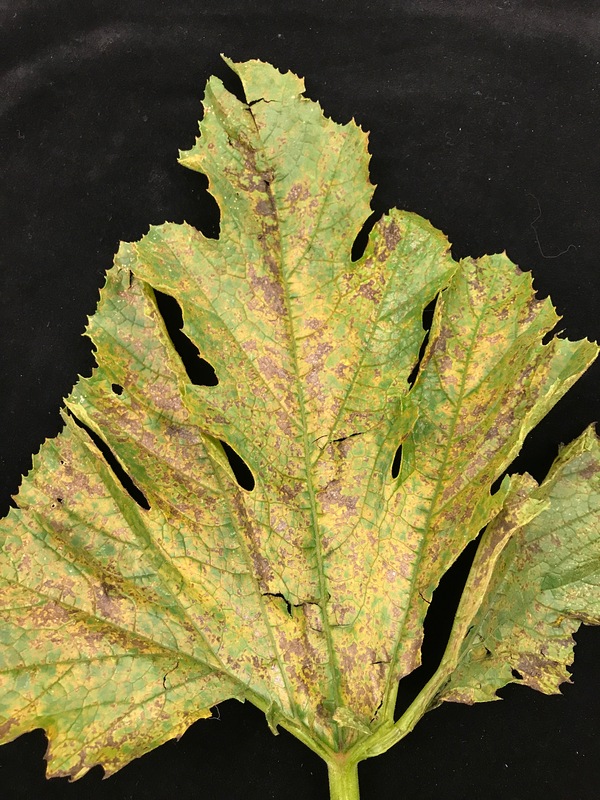 While we expect that these bacterial diseases will continue to be a problem, growers and scouts should be on the lookout for downy mildew in all cucurbit types. Symptoms caused by bacterial diseases, Alternaria and sometimes anthracnose can look like downy mildew. If you are unsure, send a sample to the OSU Vegetable Pathology Lab in Wooster for confirmation. There is no fee for Ohio residents. You can also text or email photos – please be sure the images are sharp, as close up as possible, and include both the upper an lower side of the leaf – to me at 330-466-5249 or miller.769@osu.edu. We can’t always diagnose from photos but they can be a good place to start. Most growers have been protecting cucurbits for the last few weeks with a protectant fungicide such as chlorothalanil (Bravo, Echo, Equus, Initiate versions), which will also help manage anthracnose and Alternaria leaf spot. At this late date and with confirmed cases in Ohio and our surrounding states, growers should consider including additional fungicides in their spray programs. The chart below shows our 2017 bioassay results for fungicide efficacy against downy mildew. Always rotate fungicides with different modes of action and follow label instructions. Remember that Orondis Opti applications are restricted to 1/3 of the total fungicide applications. Under highly conducive environmental conditions, apply fungicides on a 5-7 day schedule. When the risk is lower due to hot, dry, sunny weather, or downy mildew has not been reported in the area, the schedule may be stretched to 7-10 days. Information on fungicides for vegetables, including Fungicide Resistance Action Committee (FRAC) code and greenhouse use can be found in a table beginning on page 79 of the 2018 Midwest Vegetable Production Guide for Commercial Growers. Pre-harvest intervals are shown for each crop/fungicide combination throughout the guide. Options for organic cucurbit production are limited. Many organic-approved products include cucurbit downy mildew on their labels, but most are not very effective or ineffective. A copper-based fungicide such as Champ usually is the most effective in research trials, but generally control is not complete. These products must be applied preventatively, before the downy mildew pathogen infects the plants. Cultivars with some resistance to downy mildew should be used. Dr. Meg McGrath of Cornell University has summarized recent research throughout the US on organic-approved products for control of downy mildew and other diseases of vegetable and herb crops. 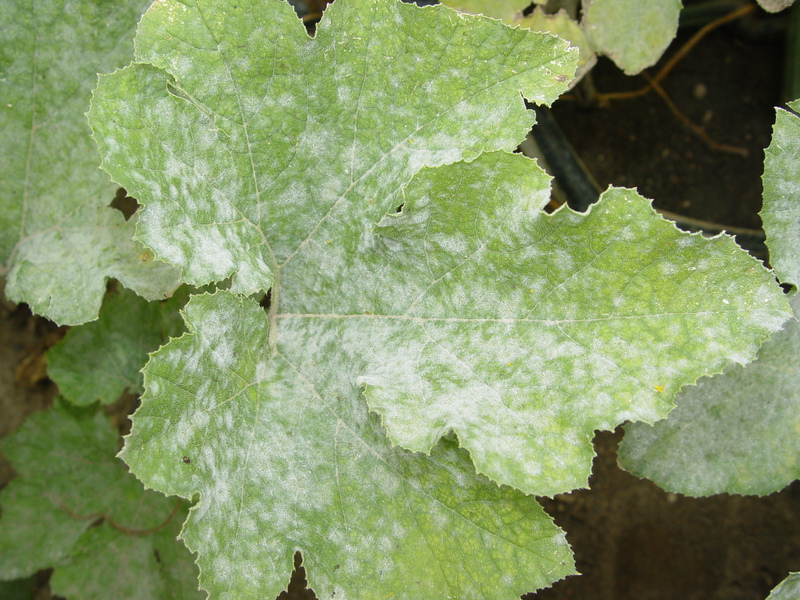 Powdery mildew is managed using powdery mildew-resistant varieties and fungicides. Development of insensitivity to overused fungicides is common in populations of the fungus that causes this disease, so it is important that a fungicide resistance management program is followed. 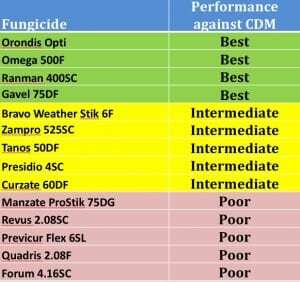 Remember to alternate fungicides in different FRAC (Fungicide Resistance Action Committee) groups, indicating different modes of action against the fungus. It is important to apply fungicides when the disease first appears and incidence is low. Fungicides that are effective against cucurbit powdery mildew can be found in the Midwest Vegetable Production Guide for Commercial Growers; product ratings and FRAC codes are on page 125. 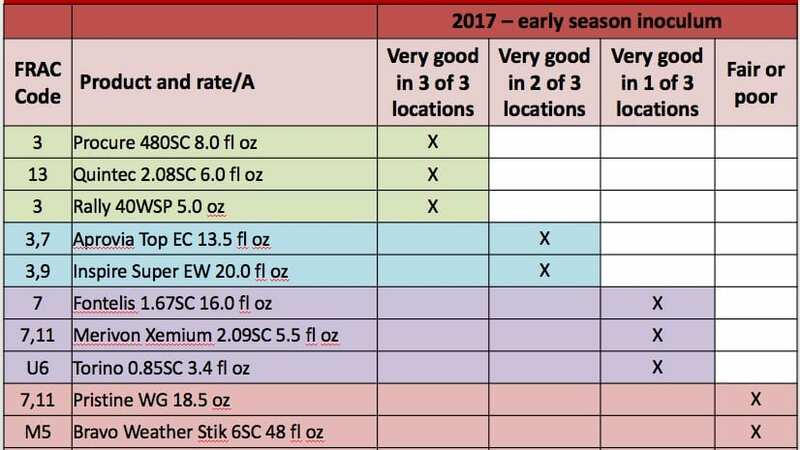 Our evaluations of efficacy of powdery mildew fungicides at three locations (Wooster, Columbus, South Charleston) in Ohio in 2017 indicated that Procure, Quintec, and Rally consistently provided very good control of powdery mildew on pumpkins in all three locations (see table). Approvia Top and Inspire Super were very good in two locations but fair in a third; and Merivon Xemium, Fontelis and Torino were very good in one location and fair in two. Both Bravo and Pristine performed poorly in all three locations. 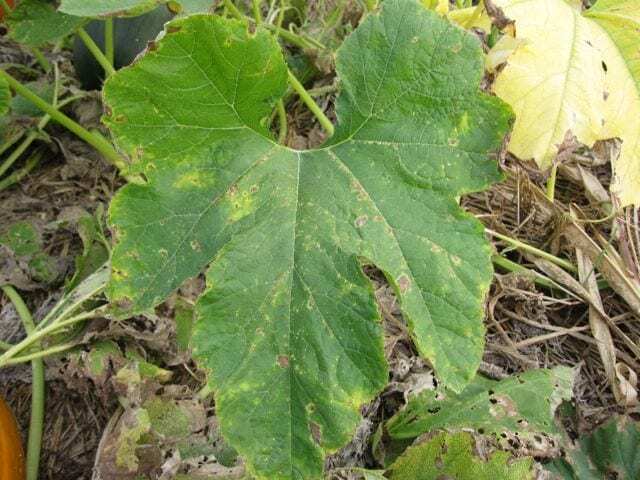 Cucurbit downy mildew is marching up the U.S. eastern seaboard from Florida to central Pennsylvania, but has not been reported in Ohio, Michigan or Ontario as of July 12. This is later than normal for Ohio – last year our first cucumber downy mildew report was on June 28. Excessive heat followed by sunny days have likely contributed to the delay. However, cucurbit growers should be vigilant and scout their fields regularly for downy mildew. These crops should be protected now with an effective protectant fungicide such as chlorothalanil (Bravo, Echo, Equus, Initiate versions), which will also help manage anthracnose and Alternaria leaf spot – we have seen an unusually large amount of Alternaria leaf spots in various crops this summer. When we start experiencing cooler, rainier weather with high humidity and overcast skies, the downy mildew risk will increase. 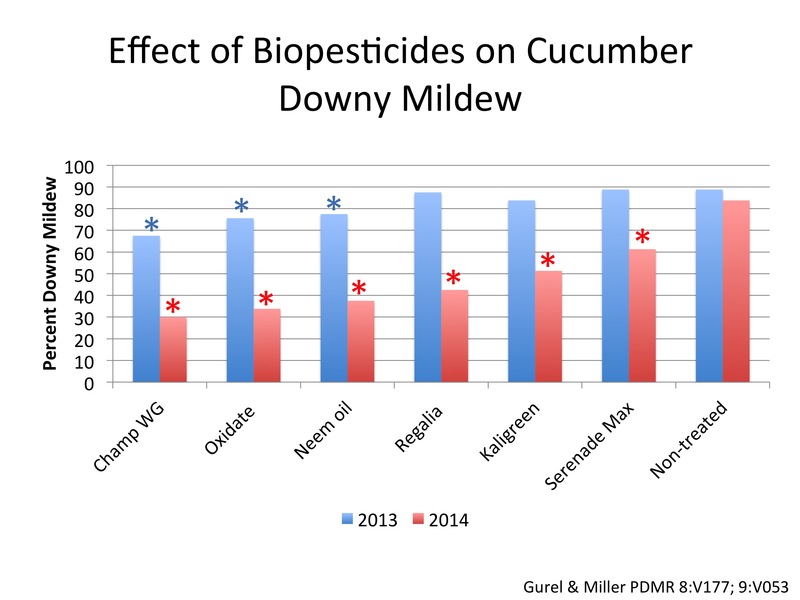 We evaluated numerous fungicides for efficacy against cucumber downy mildew in 2017 (see chart below). Ranman 400SC, Orondis Opti, Omega 500F and Gavel 75 DF performed best in these tests. 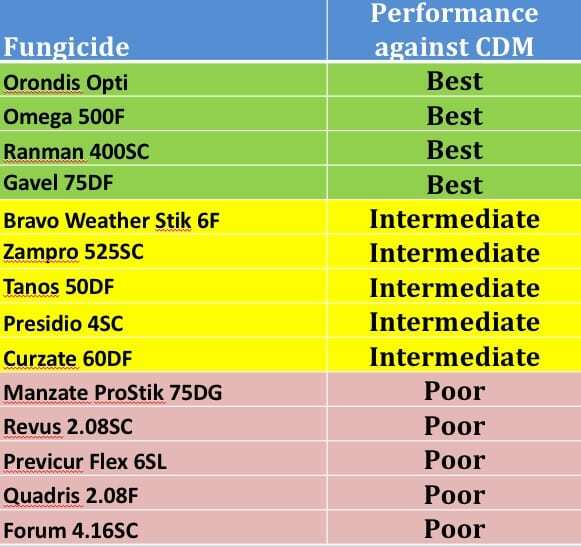 Bravo Weather Stik 6F, Zampro 52SSC, Tanos 50DF, Presidio 4SC and Curzate 60DF were intermediate in efficacy and can be used as rotational partners in a fungicide program, particularly under low to moderate disease pressure. The poorly-performing fungicides are not recommended for downy mildew management. Always rotate fungicides with different modes of action and follow label instructions. Remember that Orondis Opti applications are restricted to 1/3 of the total fungicide applications. Under highly conducive environmental conditions, apply fungicides on a 5-7 day schedule. When the risk is lower due to hot, dry, sunny weather, or downy mildew has not been reported in the area, the schedule may be stretched to 7-10 days. Cucumber and cantaloupe downy mildew risk is much higher in northern than in central and southern Ohio at this time. Crop rotation. Phytophthora produces structures called oospores that can survive for a number of years in the soil. Plan to rotate out of peppers, cucurbits or green beans for 4-5 years if Phytophthora blight has been a problem. Resistant varieties. A few pepper varieties are resistant to the root rot phase of the disease. In general, these varieties are susceptible to the crown rot phase, which affects foliage and fruits. Varieties with moderate to good resistance to Phytophthora blight are: Paladin, Aristotle, Declaration, Intruder, Vanguard (bell); Hechicero (jalapeño); and Sequioa (ancho). Well-drained soil. Avoiding standing water is critical to limiting the movement of Phytophthora from plant to plant. Avoid surface water for irrigation. We have found Phytophthora in irrigation ditches and ponds as early as late June in vegetable production-intensive areas in Ohio. Using surface water for irrigation is risky, especially if Phytophthora is present in fields near surface water sources. Plant on raised beds. Prepared properly, raised beds will help prevent standing water near pepper plants. If possible beds should be domed, and there should be no depressions in the soil surrounding the plants. Sanitation. Phytophthora can be moved from an infested field to a clean one on soil clinging to boots, equipment, etc. Power washing to remove soil is a good first step, followed by rinsing with a sanitizer. Do not build cull piles containing discarded peppers or cucurbits – plant material needs to be disposed of, preferably by burying, far from fields and surface waters. Fungicides. There are a number of fungicides labeled for use on peppers to manage Phytophthora blight (see table below). The newest product, Orondis, has very good efficacy against this disease. It is available as a pre-mix with either Revus (Orondis Ultra), Ridomil (Orondis Gold) or Bravo (Orondis Opti). There are many restrictions on the use of Orondis – including the number of applications (no more than 1/3 of total applications for Phytophthora blight) and when it can be applied (to the soil or to the foliage but not both). Orondis Ultra and Orondis Gold can be applied in transplant water or through the drip, although Orondis does not move much in soil and emitters need to be right next to the plant. 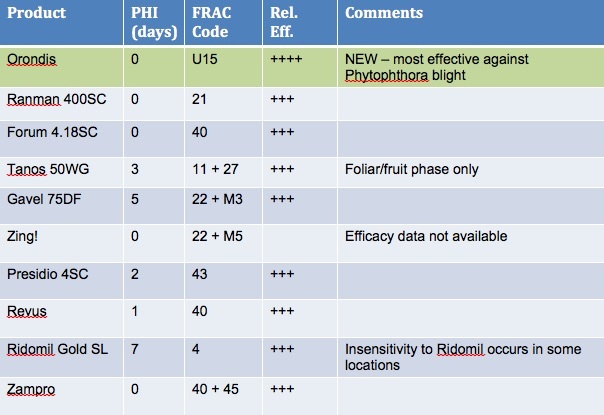 If the pepper variety is susceptible to Phytophthora blight, it may be a good idea to apply Orondis Gold or Orondis Ultra at planting, and follow up later with a program containing at least two of the fungicides with activity against Phytophthora (see table). If the pepper variety is resistant to Phytophthora, any of the three Orondis products can be used in a foliar fungicide program that includes other effective fungicides. The Bravo component of Orondis Opti will not help with Phytophthora blight, but will control anthracnose. Orondis Gold is considerably more expensive than Orondis Ultra and Orondis Opti, and resistance in Phytophthora to the Ridomil component of Orondis Gold has been found in numerous locations. For in-season control where an at-plant application of one of the Orondis products has not been made, foliar applications can be very effective if undertaken preventatively. Results of our research in 2016/2017 on squash indicated that foliar applications of Orondis Ultra could be alternated with Presidio, Ranman or Tanos + Kocide with equivalent results (see chart Squash Phytoph Orondis foliar 1 slide-2eauh2g). It is often easy to tell if a plant is sick when it is covered in spots or leaves and fruits are rotting away, but it can be much more difficult to tell when a plant has an infection in its roots or stems. These lower portions of the plant are essential for health and productivity, but are often attacked by pathogens that reside in the soil. 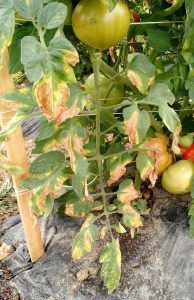 Below are some of the most important soilborne diseases of tomatoes and methods for managing them. V-shaped necrosis and yellowing of leaves characteristic of Verticillium wilt. In general, some clues that indicate if a tomato has a soilborne disease includes stunting, wilting, yellowing, dieback and reduced yield. These are also symptoms of nutrient deficiencies and some viruses, so it is important to rule out these possibilities. 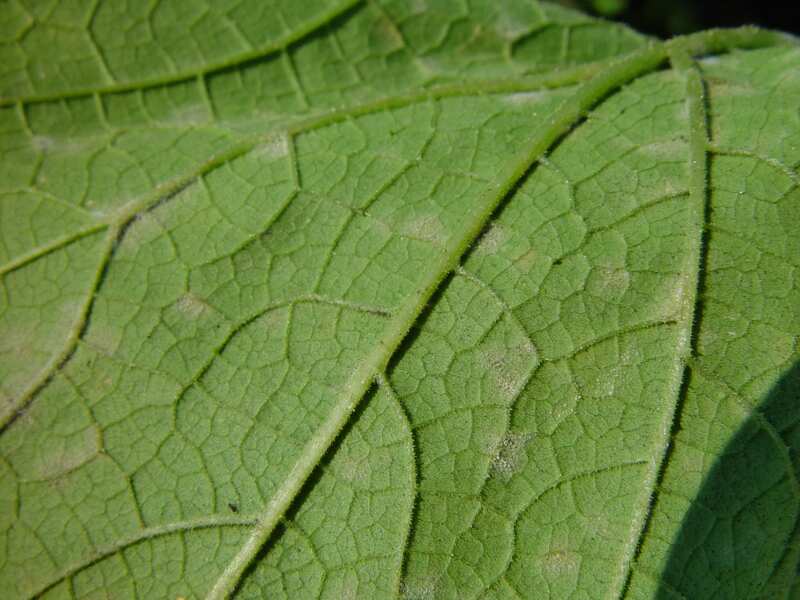 Verticillium wilt: Distinctive V-shaped lesions form on the edges of leaves, with V-shaped dead tissue surrounded by a yellow halo. 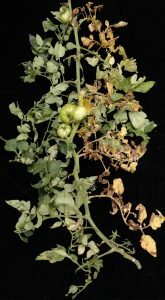 Plants wilt and have yellowing and dieback. Plants may wilt during the day and recover overnight. The inside of the stem has brown discoloration. Tomato plant with Fusarium wilt. Note the yellow discoloration on only half of the plant. Fusarium wilt: Plants have yellowing, dieback, and wilting. Sometimes only half a leaf or leaves on only one half of the plant turn yellow and die. The inside of the stem has brown discoloration near the soil line and discoloration may continue up the stem. Roots may look brown and rotten. Corky root rot: Plants may appear slightly yellow and have weakened growth. Roots appear to be dry, brown, and cracked and have a similar appearance to tree bark. Cracked areas usually occur in distinctive bands and may be swollen. Dark brown cracking may occur on the crown and taproot of the plant. Black dot root rot: Roots are discolored, usually a honey-brown to grayish-brown, and are speckled with black dots. 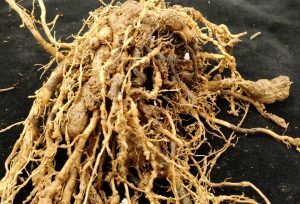 Root knot: Roots are misshapen with small to large nematode-induced galls. Galls may range in size from pin-head to finger-sized. 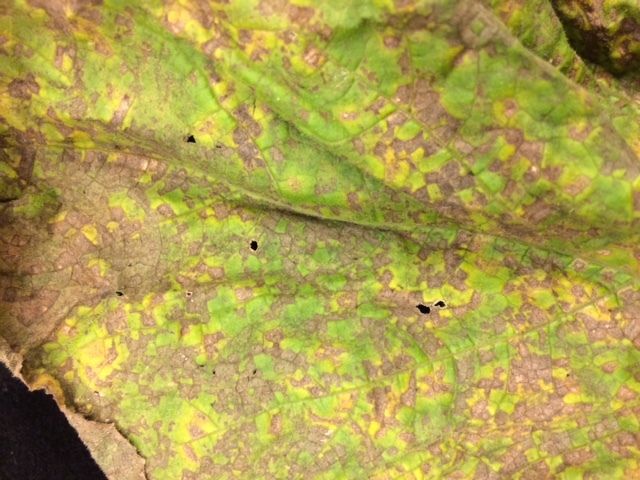 Golden-brown dots (egg masses) may appear on the outside of galls. Plants may appear stunted and weak. Roots with severe corky root rot. Note the cracked, corky, bark-like roots. Roots with sclerotia of Colletotrichum coccodes, the causal agent of black dot root rot. The honey brown discoloration is also characteristic of this disease. Tomato roots with severe root knot nematode galling. Verticillium wilt is caused by the fungus Verticillium dahliae, which has an extremely broad host range. There are two races of V. dahliae that infect tomatoes. Fusarium wilt is caused by the fungus Fusarium oxysporum f. sp. lycopersici and there are three races that infect tomatoes. The pathogen is an excellent soil survivor. 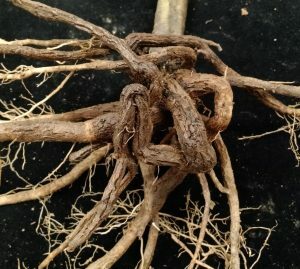 Corky root rot is caused by the fungus Pyrenochaeta lycopersici and survives in soil via microsclerotia that form on roots. Black dot root rot is caused by the fungus Colletotrichum coccodes, which also causes anthracnose on tomato fruits. 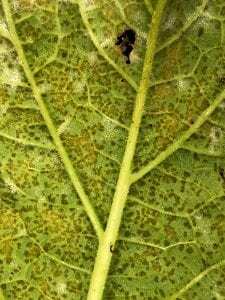 The pathogen is capable of surviving in soil by microsclerotia that form on infected fruit and roots (the black dots). Root knot nematodes belong to the genus Meloidogyne. 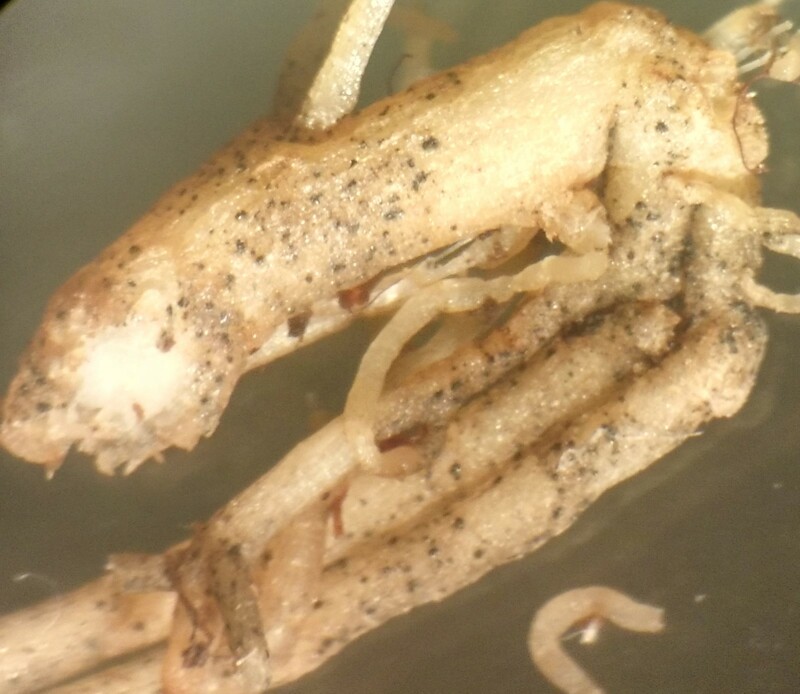 Both the northern root knot nematode (Meloidogyne hapla) and southern root knot nematode (Meloidogyne incognita) are present in Ohio tomatoes. In general, M. hapla forms smaller, distinct galls on tomato roots, while M. incognita tends to form larger, fused and malformed galls. Both species of nematodes have extremely broad host ranges. How can I manage these diseases? 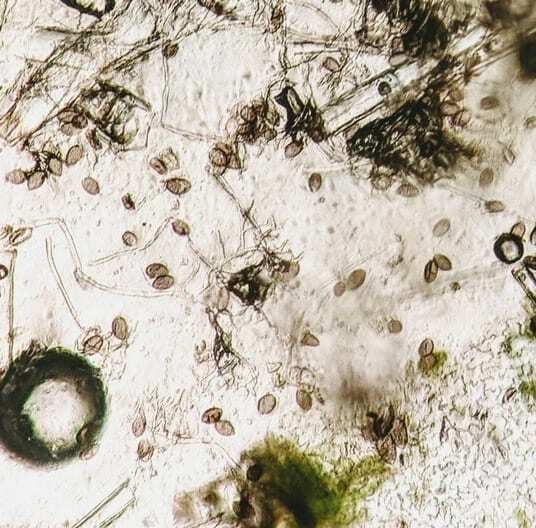 When managing soilborne diseases, growers should combine management practices that prevent existing soilborne pathogen populations from increasing with practices that actively reduce pathogen populations in the soil. Prevention: For transplant production, always use clean planting materials including seed, soilless media (recommended) and well or “city” water for irrigation. Ensure that seedlings are healthy before transplanting. Maintain proper fertility and watering to ensure healthy seedling development and maintain adequate nutrient and water levels throughout crop development. Sanitation: Remove diseased plants and diseased plant parts. Clean soil from boots and equipment between fields and high tunnels. Do not move from soilborne disease-affected fields to non-affected fields. Rotation: Rotate out of the same plant family when possible. For pathogens with extremely wide host ranges, such as Verticillium sp. and Meloidogyne spp., it is difficult to rotate to a suitable non-host crop. Since most soilborne pathogens are excellent soil survivors, rotations of 3-5 years are usually necessary to reduce pathogen populations adequately. Host resistance and grafting: Resistant varieties should be selected whenever possible and resistance to Verticillium wilt and Fusarium wilt is incorporated into most modern tomato varieties. Grafting a disease susceptible scion onto a disease resistant rootstock can reduce damage due to soilborne diseases. 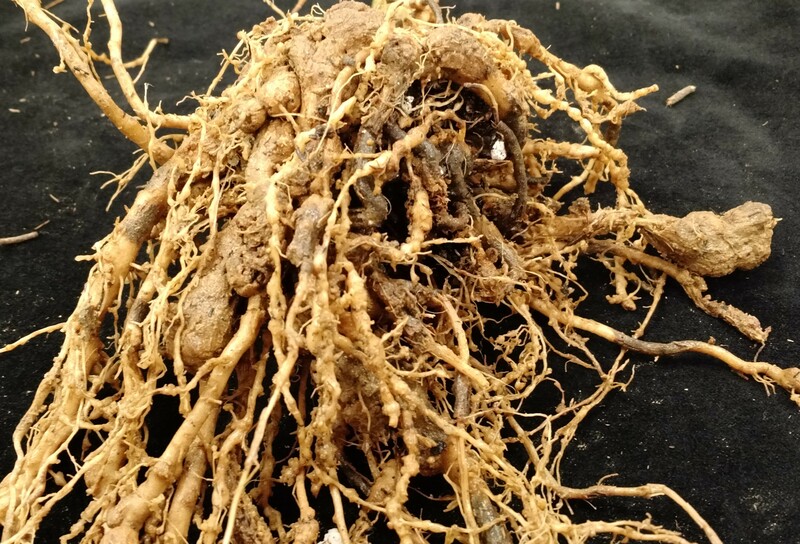 Many commonly used rootstocks have resistance to Verticillium wilt, Fusarium wilt, corky root rot, and some resistance to root knot nematode. Soil disinfestation: Several soil disinfestation options are available that vary in cost, efficacy, and environmental impact. Chemical fumigation and steam sterilization are two options that have been used historically, but are often not feasible for use on vegetable farms. Anaerobic soil disinfestation is a newer method of soil disinfestation that involves amending, saturating, and tarping soil. 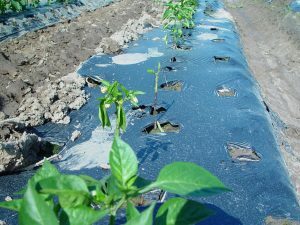 Soil solarization uses solar-generated heat trapped under plastic sheeting to kill soilborne pathogens, but this technique is not often effective under Midwestern conditions. Soils can be flooded or left fallow to kill pathogens over a period of time, but these methods are often ineffective due to the survival structures of most soilborne pathogens. Chemical or biological control: Few options are available and many biological control options are still experimental. Zucchini leaf with severe downy mildew. Small blocky lesions are yellow initially, then turn brown as leaf tissue dies. Diseased areas merge and eventually entire leaves die. 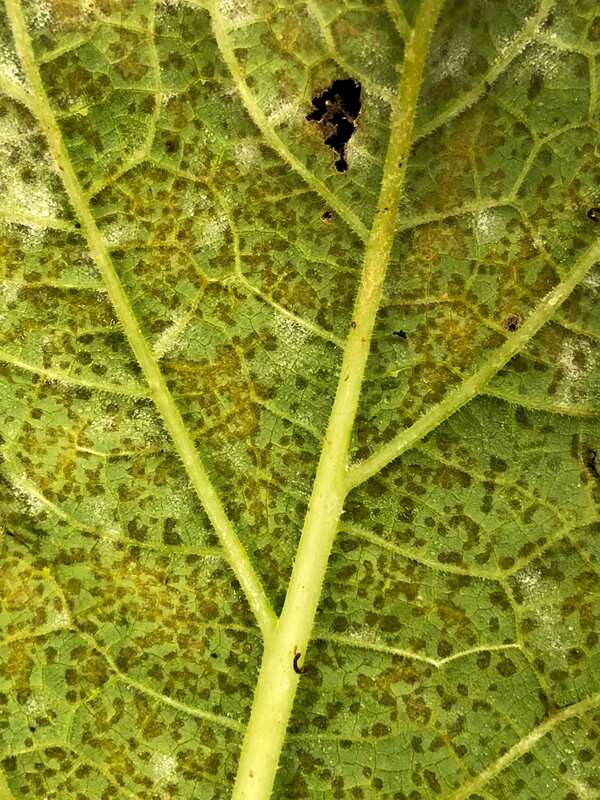 While we suspected that downy mildew might be present in southern or central Ohio based on weather conditions, storm trajectories and outbreaks in other states, we had not confirmed it until this weekend in pumpkins and today from zucchinis. The Pike County pumpkins were in a cultivar evaluation trial at the OSU-OARDC South Centers near Piketon. The zucchinis came from two organic farms in Guernsey County. The organic growers indicated that they had observed downy mildew symptoms about 2 weeks ago. None of the fields had been treated with fungicides effective against downy mildew. 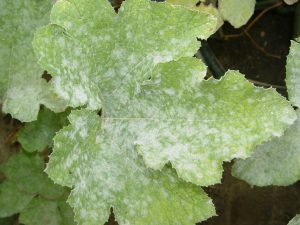 As you can see in the zucchini leaf photos in this post, downy mildew can be very severe on squash; similar symptoms can occur on pumpkins. Fungicides should be applied before symptoms are observed – recommended fungicides can be found here. Organic growers have limited options for downy mildew management. OMRI-approved copper-based fungicides are somewhat effective if applied preventatively. In the chart below, you can see that control varies by year – in this case good in 2014 and poor in 2013. 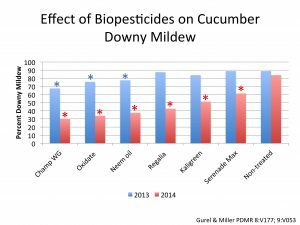 In both years, downy mildew was significantly less severe in cucumbers treated with Champ WG, oxidate or neem oil than in non-treated control cucumber plants. Since these are all protectant fungicides, it is critical that they be applied before plants are infected with the downy mildew pathogen. In a separate study conducted at the University of Maryland (Everts & Newark, Plant Disease Management Reports 8:V210), Champ WG alternated with Serenade Soil or Actinovate was as effective as Champ WG alone in reducing downy mildew severity in both cucumber and muskmelon. 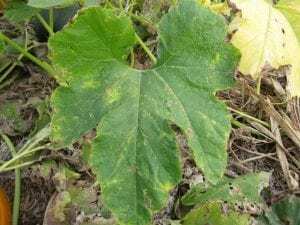 Are Pumpkin and Squash at Risk for Downy Mildew in Ohio? Severe downy mildew on pumpkin, 2015. Downy mildew has still not been confirmed on pumpkins and squash in Ohio, although the disease is widespread on cucumbers and melons throughout most of the state. 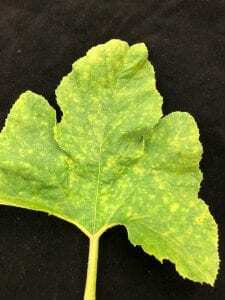 This is the time of year when we really start to look for downy mildew on squash and pumpkins, as strains of the pathogen that attack these crops move into the area from the south, usually aided by remnants of hurricanes or tropical storms that reach Ohio. Remnants of tropical storm Harvey are likely to reach southern Ohio at least by Friday. Downy mildew spores can be transmitted long distances in the air, and are brought to the surface by rain. 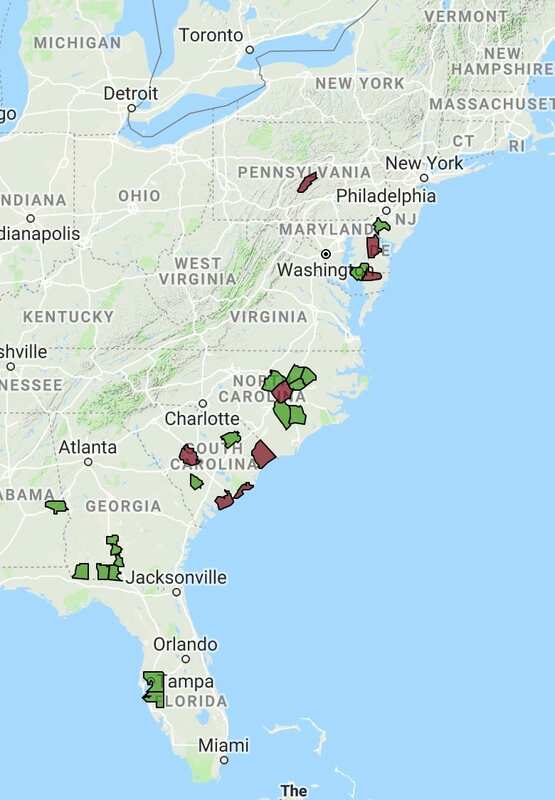 We are particularly concerned with outbreaks reported in Kentucky on butternut squash this week (http://cdm.ipmpipe.org/scripts/map.php), an indication that the pathogen is established in the area and can serve as a source of inoculum for areas to the north and east. Growers in southern Ohio should be especially vigilant, although we recommend stepped-up scouting of pumpkins and squash, and application of protectant fungicides, throughout the state. 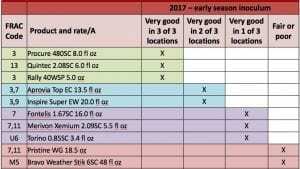 Fungicide recommendations can be found in my June 28 post.